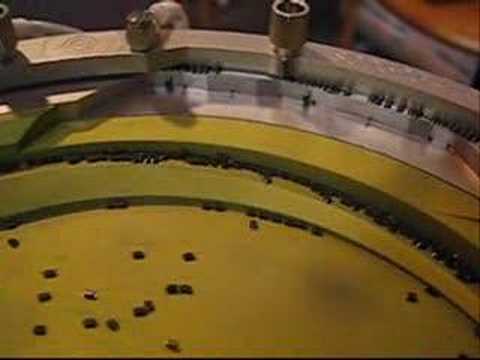 Operation Description: The pieces are passed into the bowl feeder via a chute in which a quantity of purely one type of component has been loaded. After the sorting they are passed over a linear track with the orientation ‘standing lengthwise, the rectangular opening with the white seal downwards’ to a rotating glass plate. A camera views from underneath the plate through the glass into the opening of the cap and checks it according to the above mentioned criteria. The pieces are blown subsequently into the bags. When 5000 +/- 5 pieces is reached then a bag-change takes place. The pieces which are not usable are discarded at a separate station into a container. Operation Description: The parts are pre-sorted in the bowl feeder on three tracks. To detect the orientation of the opening, proximity switches are employed. The three individual tracks run together into one track on the linear track. The post-inspection of the orientation is carried out with a further sensor. All incorrectly lying pieces are blown out, back into the bowl. The parts are accumulated on the linear track and at the end they are passed freely running to the subsequent machine. Operation Description: The components arts are operator placed into a 10 Litre vibratory bowl feeder. Pre-orientation takes place in the bowl mechanically; no tooling sections are required to be changed in the bowl. Air jets are changed for different component types via rapid action couplings. The required final orientation is on the dowelled exchangeable linear track tooling sections. 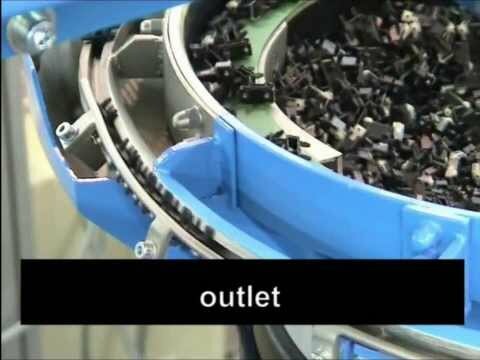 When finally orientated, the parts are transferred to the conveyor belt provided by the customer into the assembly process machine.